It’s surprising, but we finally have an episode worthy of the Once Upon A Time name. This season has been very bumpy and hasn’t even come close to being on the same level as the rest of the series. 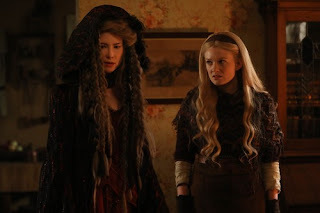 However, it seems that after eight mediocre episodes, the writers have finally woken up and delivered a classic OUAT-style episode that might just save the dwindling series. With some shocking discoveries and backstories, this was the episode that probably no one saw coming. Yes, the content is very random and definitely should have been revealed earlier in the season — but let’s just take a week to enjoy that the show might just be back. Once Upon A Time has always been really good at one thing: setting up characters and then making shocking reveals about their true identities. The way the series played off of hidden identities, particularly in its first two seasons, made it one of the most unique shows on television. I have spent most of this season bashing the show’s inability to reboot itself in new ways, since it mainly is a worse copy of the first season. For the first time, I can truly applaud the use of one of the staples from early on in the series. I don’t have any doubts that almost all of the show’s audience didn’t think that the new characters were anyone other than who they said they were. There have been no indications that these characters had hidden identities, whereas the original characters weren’t always so open with who they were (think that awesome Pinocchio reveal). So, it was rather shocking to find out the true reason why Rapunzel has randomly popped up in the middle of the season. You wouldn’t recognize her, but that awful Victoria Belfrey is actually a hardened, burdened, and older Rapunzel (cue the gasps). This was a particularly great reveal because everything that has been shown with Belfrey/Lady Tremaine in the fairy tale realm and in Seattle has shown her as the rotten stepmother from Cinderella. For me, this is a classic OUAT pull-the-rug-out-from-under-you moment and a great way to mesh two stories together. Through a perfect amount of useful flashbacks, Rapunzel’s story plays out in a surprising fashion and shows what went wrong for the former Disney princess. The flashbacks revealed that Rapunzel and her family were dirt poor when she strikes a deal with Gothel to give her family happiness. This family includes sick husband, Marcus, and Rapunzel’s two small kids: Anastasia and Drizella. In typical sketchy witch fashion, this means that Rapunzel will be locked in a tower forever while her family gets a new life. After six years of solitude, Rapunzel escapes the tower on her first attempt and magically finds her family, who appear to be living pretty close to the tower. While that part was quite dumb, the family reunion was very interesting. Now young tweens, Anastasia welcomes Rapunzel back with open arms, while Drizella is distant and doesn’t feel Rapunzel is her mother. The best reveal comes when Marcus reveals that he has remarried and has a step-daughter who, of course, is (Cinder)Ella. All three kids appear to be the best of friends and are happy together, yet Rapunzel feels betrayed that her husband found happiness without her. Rapunzel starts her journey toward darkness when Gothel appears and gives her a poison mushroom from Wonderland to make Ella’s mother, Cecilia, and Rapunzel’s problems, go away. Interestingly, Rapunzel refuses the offer for a while, yet is driven to the breaking point when Drizella calls Cecilia her mother. The mushroom gets rid of Cecilia, and Rapunzel has her perfect family back. She “kindly” allows Ella to continue living with them, but the resentment starts soon after. Thankfully, the flashbacks address what happened to Anastasia, which is the real reason why Rapunzel turned into the bitter Tremaine/Belfrey that we have known. The kids are playing on a frozen pond when Anastasia and Ella fall through the ice. Marcus tries to save them both, but can only save Ella. Obviously, Rapunzel is enraged and can’t believe that Marcus wouldn’t save their child. While the story doesn’t continue much past there, it’s safe to assume that Rapunzel continued down her dark path from there. Her development into an evil person is still up in the air and will hopefully be discussed as the season progresses. Back in Seattle, Rumple gets himself into a sticky situation when he visits Belfrey in prison. Like the snake she is, Belfrey eventually pushes enough buttons to get Rumple to admit that he is awake and knows what’s really going on. Surprisingly, Rumple agrees to a deal that will allow Belfrey to walk free, and in exchange, she will tell Rumple who “The Guardian” is. Well, I’m still not completely sure what “The Guardian” is, but more on this in a bit. Belfrey and Rumple then go on an afternoon escapade, yet Rumple doesn’t realize what he is getting himself into. Of course, Belfrey decides that now is the time to finally crush Lucy and wake up Anastasia. Rumple doesn’t realize how Belfrey plans to wake up her daughter until Gothel of all people tells him what he has gotten himself into. Rumple has shown minimal emotions in Seattle and has not appeared to be the changed man that he was with Belle. However, once he realizes that his great-great granddaughter is in trouble, he stops everything and will do anything to save her. He even gets Hook involved, who still hasn’t woken up, and tells him a bit of the truth. It was odd that Rumple tells Hook some of his backstory, but hasn’t woken him up yet. There’s no reason for Hook to still be in the dark, so hopefully he regains his memories soon. After Rumple shows some emotion, we learn that he is too late, as Belfrey has told Lucy the truth only to crush her tiny spirit. Anastasia has been clinging to life in a nearby hospital the whole time, thanks to Gothel saving her last breath in a flashback to the fairy tale realm. A single tear from Lucy is all it takes for Belfrey to wake up Anastasia, which sends Lucy into a similar coma that Henry was in when he ate the poison apple in season one. With Regina and Henry out of town, there’s no doubt that Henry is going to have to come back to Seattle to save Lucy with true love’s kiss, thus more than likely breaking the curse. With Anastasia coming back to the living, it’s hard to say what Belfrey will do next. Drizella clearly wants her sister’s magic, but we still don’t know how they have magic or what Anastasia’s powers may be. There is also this “Guardian” business that needs to be settled. In the flashback where Gothel “saves” Anastasia, Gothel makes a speech about how she thought Rapunzel could have been “The Guardian” and that maybe Anastasia could be since she was wrong about Rapuzel. While there isn’t much revealed about what “The Guardian” is, it is clear that Anastasia might fit the bill. Rumple is also supposedly searching for “The Guardian,” probably because this is the only person who could take his darkness and free him from being the Dark One. This was a very interesting episode that didn’t go anything like I thought it would. The season has taken a sharp turn, so let’s hope that it can continue to keep getting better.